Original Content: The Annotated "Saving the Planet & Stuff" Part Seven: What To Do, What To Do? The Annotated "Saving the Planet & Stuff" Part Seven: What To Do, What To Do? The following excerpt is one of my favorite bits from Saving the Planet & Stuff. In order to create humor, I use hyperbole to ramp up the decision-making those trying to live environmentally sound lives do. But I also think this conversation illustrates a real struggle. See my picnic dish collection to the right? I've had them since 2001 and used them for large family al fresco meals over the years. I don't buy paper plates or napkins or plastic picnic cutlery. But it takes quite a while to get these things washed. Cheap plastic must hold grease. Sinks full of water go down the drain before we finish the job. 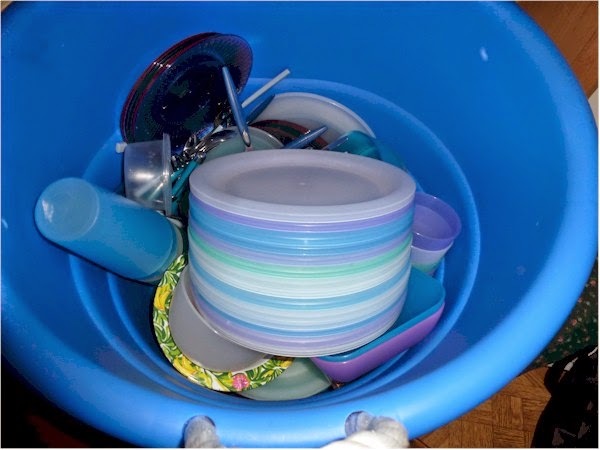 But I've done the kind of thinking Nora does below and decided that my priority is solid waste, those disposable paper plates and cutlery, over detergents and water. If I lived in California right now, no doubt I'd feel differently. Seriously, I don't live all that environmentally sound a lifestyle. People who do have to do this kind of priority assessment all the time. "Michael? I'm Maureen Bogda," she announced. "Associate editor," Amber reminded him. "Don't ask what that is. I was here all of July and August last year and never figured it out." "We have something we'd like you to take care of for us. We need you to go out and pick up a few lunches," Maureen said as she handed Michael several orders with cash clipped to them and explained how he would find the restaurant. Amber caught Michael's eye. "Speaking of sucky work—"
"Oh, no!" Michael objected. "I like buying things." "I'm glad to hear that," Maureen said, "because Nora asked if you would stop at the little grocery store on the corner to pick up some soy milk and eggs. She wants the free-range eggs from chickens that have never lived in cages, if they have them this week. However, she says that if they are packed in a plastic package to please check and make sure the package is either number one or two plastic because that's all we can recycle in this town. If they have the free-range eggs, but they're packed in the wrong kind of plastic, don't get them. Get regular eggs, but make sure the regular eggs are in a cardboard package, not Styrofoam, because Nora doesn't buy Styrofoam." "Uh … just a minute. I'd better write that down," Michael said as he started to look over Amber's desk, hoping to find some paper. "Nora did it for you," Maureen replied as she handed Michael another piece of paper and some more money.